Since Marie Kondo’s show landed on Netflix in January the nation has gone declutter mad. So, how can you tackle the mess in your own home? Kondo is a Japanese declutter guru advising us all to throw out anything that doesn’t ‘spark joy’ in our lives with her Netflix show Tidying with Marie Kondo. So many people are taking her advice on board charity shops are reporting a surge in donations. 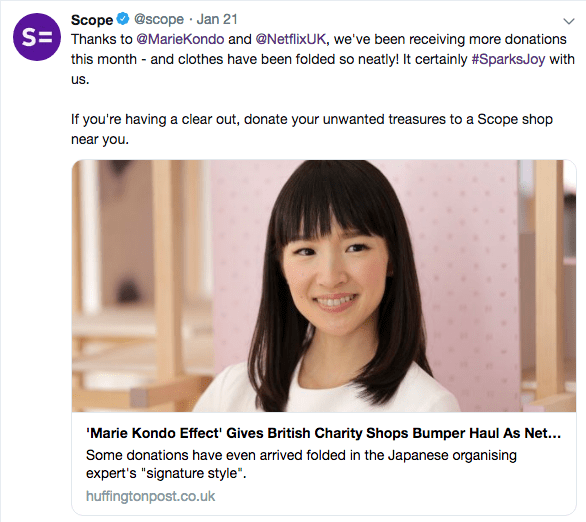 Scope has seen a 5% year-on-year increase in donations to its shops at the start of the year, which it is putting down to the Kondo effect. Decluttering isn’t just about helping your nearest charity shop. Many of us have gardens stacked full of old children’s toys, rusty trampolines and rotting playhouses and spare rooms crammed high with old furniture and that old running machine you never use. It’s time to clear them out. Our partner AnyJunk surveyed property experts and estate agents and the majority agreed that a clear out can make your home appear bigger, boost the value and allows a buyer to visualise the property as ‘theirs’ more easily. 1. Clear out your clothes – Kondo recommends getting all your clothes out and piled up on a bed. That way you can see how much you’ve got, and everything will have to earn its place back in your wardrobes and drawers. If something doesn’t fit get rid of it. Recycle anything damaged beyond repair. Also, discard anything you simply don’t wear anymore. Take everything you don’t want to your local charity shop. 2. Tidy toys – Children’s toys can quickly take over your home but throwing them away brings fears of tantrums. Gather everything together and assess each toy. Anything your child has grown out or doesn’t use send to the charity shop. Things that take up too much space or you have more than one of donate. If it is broken recycle it. 3. Sort your spare room – Anything that someone else may use, exercise equipment, furniture or ornaments can be donated to charity or sold online. If you have broken goods that needs throwing out consider Any Junk, a household rubbish removal service. They’ll send two crew members to collect bulky waste and junk from anywhere in your home. They offer same day collection in some cities. Once your spare room is clutter free you could boost your income by getting a lodger or simply renting out your free storage space. 4. Empty kitchen cupboards – Your kitchen can become a stressful space if every cupboard is overflowing with gadgets and tableware you don’t use. If it is broken, or you never use it, get rid of it. Then store the remaining things sensibly. Use high shelves for things you rarely need and keep your everyday essentials in easy reach. Decided a declutter isn’t enough to make your kitchen work for you? Read our guide to kitchen renovations. 5. Paperwork – For many of us a lot of space is taken up with paperwork. Receipts, credit card bills, and general paperwork fill boxes, drawers and bookcases. Ask yourself why you’ve held onto something and if you will ever need it again. If you don’t need it recycle it, making sure to shred anything that contains sensitive information. You can also check our handy list of essential household documents to see what you must keep hold of. We have teamed up with AnyJunk, the UK’s largest operator for bulky household rubbish removal to assist you with your household waste removal needs. They can help remove unwanted heavy appliances or furniture. It’s cheaper than hiring a skip and you don’t have to do the heavy lifting. Once your house is clutter free take a look at our home maintenance checklist for a season by season guide to keeping your house at its best. Great article. I’m definitely in the I like to chuck out camp, but I have regrets. My granny’s gold ring I sold, the silly goose milk jug that spewed milk from its beak…I’m curious about what people do with old birthday cards & letters? I feel so bad to let them go.